It’s really difficult to make squid look good on a phone camera (plus I was in a hurry to tuck into my dinner, so I put zero effort into it). You’ll just have to take my word for it, these were awesome! I know they don’t look very appetizing in the picture – but just trust me! Pulse the bread in food processor until you get breadcrumbs. Add spring onion, parsley, lemon zest, garlic and chilli. Pulse until well-combined. Heat a fry pan with a little olive oil. Add bread crumb mixture and cook until dry and toasted. Add tomatoes and stir well. Remove from heat and add reserved squid tentacles. Stir well and allow to cool slightly. Once the mixture is cooled, heat a grill pan or the BBQ. Stuff the squid with the breadcrumb mixture ensuring that you really pack the mix in. Thread a toothpick through the top to close the opening. Drizzle more olive oil on top of the squid and coat generously. Place the squid on the hot pan, as soon as you see the squid turn white, flip over and cook the other side. This should take about 2 minutes or even less. 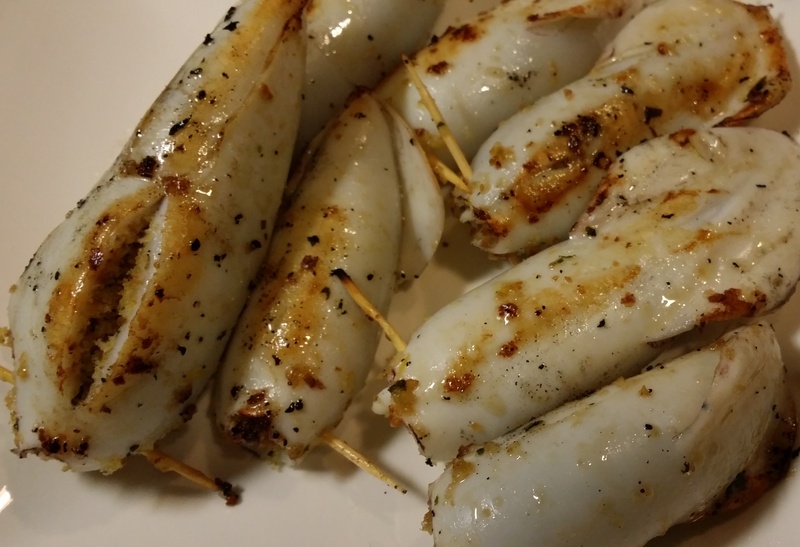 You don’t want to overcook the squid, it’ll become tough and chewy. Serve with a side salad – enjoy!